It's certainly not always easy, and often confusing, to sift through the multitude of fresh, genuine talent somewhere out there that is breaking through new ground like spring crotons pushing their colorful heads up along urban sidewalks to add an unexpected and enjoyable experience to our daily lives. 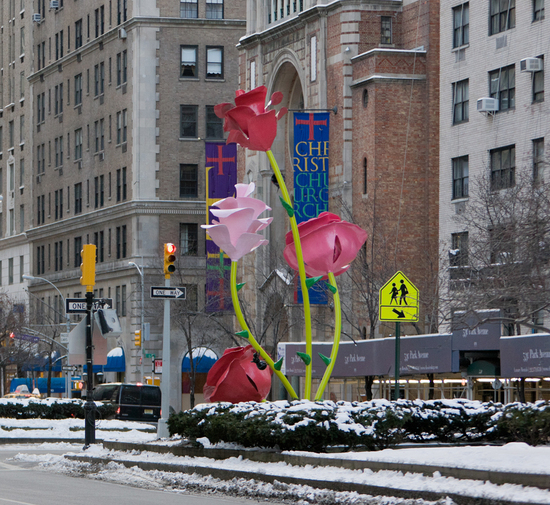 This winter, young sculptor, Will Ryman, challenged the harsh colorless Manhattan winter by "planting" 38 larger-than-life painted aluminum roses in the middle of the frozen boulevard on Park Avenue, which was one of the best and most talked about public installations of the winter season and definitely impossible not to notice. His work is a perfect example of how art can stimulate our visual senses while increasing our appreciation of the intellectual forces behind genuine creativity and sheer invention. But most of the great new, underexposed innovative talent is usually not out on the street, but hidden from sight in the back room of a gallery, or gathering some dust in a distant artist's studio that may never literally see the light of day. Unfortunately, it would take years to unearth and evaluate much of the promising works that are somehow finding their way into galleries and faraway art fairs around the world. This regular column investigates and recommends artists to watch that you may never have heard of before, but you will indeed be hearing a lot more about. The Art Economist analyzes the art market and individual artists who are among the top living and earning artists in the world. In addition to news, art market updates and features on artists, collectors and dealers' activities, the publication offers analysis on "Artists to Watch" and profiles on prominent artists. Please visit The Art Economist for additional information. David Ellis, True Value (Paint Fukette), 2011, Kinetic sound installation, Dimensions variable, Courtesy Joshua Liner Gallery, New York.